Mathematics always helps in solving personal financial problem. 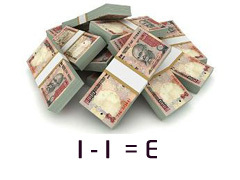 You apply number of formulas in financial life like IRR, CAGR, Absolute return etc. But do you know formula to become wealthy. I am here with simplest formula to become wealthy! While doing financial behavior analysis I found four different people operating on four different formulas. These types of people on receipt on income keep certain money aside as saving and then spend the rest. They keep saving either in bank account or may be in low risk low return investment instrument. These types of people believe in different theory. They earn money, spend money and if anything is left save it. Today’s generation believes in above formula they spend entire income borrow money and blow entire amount at expenditure. Above formula is simplest formula to become wealthy. Generate more and more income, Invest as soon as you receive you income and spend remaining amount to fulfill your essential need. I suppose we already know this formula but do not follow it. If we follow this formula regularly wealth will follow us. 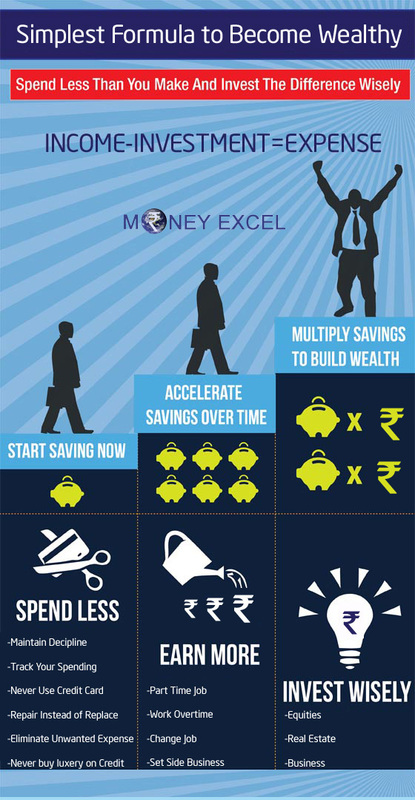 Simple steps towards building wealth are to (1) plan, (2) budget, (3) learn, (4) earn, (5) save, and (6) invest. Remember Wealth building requires discipline. If you really want to build wealth and are having difficulty achieving the level you desire, you might consider professional guidance. I am always happy to hear if you agree or disagree with my views. (or how above formula can be improved).